The first issue of the paper was published by James Gordon Bennett, Sr., on May 6, 1835. By 1845, it was the most popular and profitable daily newspaper in the United States. In 1861, it circulated 84,000 copies and called itself "the most largely circulated journal in the world." Bennett stated that the function of a newspaper "is not to instruct but to startle and amuse." His politics tended to be anti-Catholic and he had tended to favor the Know-Nothing faction, though he was not particularly anti-immigrant as the Know-Nothing party were. During the American Civil War, his policy as expressed by the newspaper was to staunchly support the Democratic Party. Frederic Hudson served as managing editor of the paper from 1846–1866. Bennett turned over control of the paper to his son James Gordon Bennett, Jr. in 1866. Under Gordon Bennett Jr., the paper financed Henry Morton Stanley's expeditions into Africa to find David Livingstone, where they met on November 10, 1871. The paper also supported Stanley's trans-Africa exploration, and in 1879 supported the ill-fated expedition of George W. DeLong to the arctic region. In 1874, the Herald ran the infamous New York Zoo hoax, where the front page of the newspaper was devoted entirely to a fabricated story of wild animals getting loose at the Central Park Zoo and attacking numerous people. On October 4, 1887, Bennett Jr. sent Julius Chambers to Paris, France to launch a European edition. Bennett himself later moved to Paris, but the New York Herald suffered from his attempt to manage its operation in New York by telegram. In 1916 a Saturday issue of the paper reported that a major financier was found dead poisoned, and then added that in 1901 he was "mysteriously poisoned and narrowly escaped death." In 1924, after Bennett Jr.'s death, the New York Herald was acquired by its smaller rival the New York Tribune, to form the New York Herald Tribune. In 1959, the New York Herald Tribune and its European edition were sold to John Hay Whitney, then the U.S. ambassador to Britain. In 1966, the New York paper ceased publication. The Washington Post and The New York Times acquired joint control of the European edition, renaming it the International Herald Tribune. Today, the IHT, renamed The New York Times International Edition, is owned entirely by The New York Times and remains an English language paper, printed at 35 sites around the world and for sale in more than 180 countries. When the Herald was still under the authority of its original publisher Bennett, it was considered to be the most invasive and sensationalist of the leading New York papers. Its ability to entertain the public with timely daily news made it the leading circulation paper of its time. 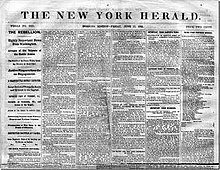 The New York Evening Telegram was founded in 1867 by the junior Bennett, and was considered by many to be an evening edition of the Herald. Frank Munsey acquired the Telegram in 1920, which ceased its connection to the Herald. New York's Herald Square is named after the New York Herald newspaper; in the north side of the square there is a sculpture commemorating the Bennetts. The statue of Minerva, the Bellringers, and Owls by Antonin Carles originally graced the New York Herald building and rang every hour until it was moved to Herald Square. The chorus of Give My Regards to Broadway includes the phrase, "[R]emember me to Herald Square." North of Herald Square is Times Square, which is named after rival The New York Times. ^ Sandburg, Carl (1942). Storm Over the Land. Harcourt, Brace and Company. p. 87. ^ Katherine Roeder (25 March 2014). Wide Awake in Slumberland: Fantasy, Mass Culture, and Modernism in the Art of Winsor McCay. Univ. Press of Mississippi. pp. 28–. ISBN 978-1-62674-117-1. ^ New Outlook. Outlook Publishing Company, Incorporated. 1892. pp. 489–. ^ Carey, John (March 18, 2007). "A good man in Africa ?". The Sunday Times. Retrieved 2007-11-15. His quest to find David Livingstone was financed by his paper, the New York Herald. Nothing had been heard of the great explorer since the previous year, when he was somewhere on Lake Tanganyika. ^ "Jacques S. Halle dies". New York Herald. December 2, 1916. p. 5. ^ "The Telegram Sold to Scripps-Howard". The New York Times. 12 February 1927.